CAN AN OCTOPUS BE TRAINED ? One of the most intriguing research projects in the brief history of the laboratory has been a study of how well the octopus "remembers". The results of this research, conducted by Paul H. Schiller of the Yerkes Laboratories of Primate Biology, were published in The Journal of Comparative Physiological Psychology under the title: Delayed Detour Response in the Octopus. Were it not for the fact that the Marine Studios biologists had so successfully maintained adult octopuses alive in captivity, Schiller would not have had a long enough interval to conduct his study of this odd animal with his capable tentacles and 360-degree vision. He had poor luck with his first experiment, which consisted of placing a crab under one of two inverted cans. The four octopuses participating in this problem first had an opportunity to study the crab under one of two transparent cups which were then replaced with the cans. After the cans had been substituted the octopuses were for short periods restrained from approaching them, the question being, how long would they remember which can covered the bait? All four scored very badly. They lifted the cans indiscriminately, sometimes both together, and seemed to have no idea whatever of what they were about. Schiller next designed an ingenious box, rather like the ground floor of a dwelling, with a front door, a hall and a room on either side of the hall. Each room had a window adjacent to the front door. In the experiment a crab was placed in a glass beaker and put, for example, in the room to the right of the front door. The octopus could look through the window and see the food, but in order to get at it they had to enter the front door, pass down the hall and turn to the right at its far end. Would the octopuses, while going down the hall, remember which room the crab was in and make the correct turn? Schiller first familiarized them with the glass beaker and gave them practice in extracting crabs from it. He wanted to make sure that they recognized it for what it offered-food. The octopuses. weighing roughly two pounds, their bodies measuring five inches and their tentacles twelve, were next turned loose on the box. upon looking through the window they saw the crab in the glass beaker and tried in vain to reach it by getting through the window. Failing in this they then went through the door. Schiller at first left out the partitions between the hall and the rooms so their only problem was gaining entrance. When they had learned this much he replaced the partitions. After relatively few attempts they became quite competent in making the right turn- in fact they almost never failed. Upon entering the door they often faced the wall of the room in which they had seen the crab and side-stepped down the hall until they reached the far door. To prevent them from orienting themselves this way, Schiller put another door with a hole in it at the far end of the corridor. While squeezing through this they could no longer remain oriented toward the bait. However their percentage of correct turns was still high. Schiller next placed at the end of the hall a solid door to delay the octopuses temporarily so that he might determine how long they could remember which way to turn. He found that if the delay was under forty seconds they rarely failed to make the correct turn. If the interval was longer than a minute they were much less successful, and if delayed tow or three minutes they became completely confused. If conditions were normal they were nevertheless able to retain the lesson learned here over a period of weeks, for when exposed to the problem again after a long interval they solved it rapidly. 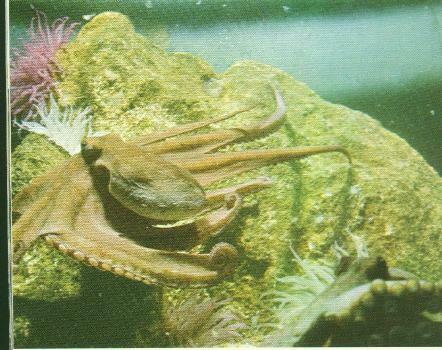 The common Atlantic octopus used in the experiment is one of more than a hundred species and is brought to the Studios from the rocky floor of the Atlantic several miles offshore. In the sea his eight tentacles usually provide motive power but if pressed he can proceed by jet propulsion and further confound his predator by ejecting an inky, smell-deadening smokescreen. In his powerful tentacles, horny beak and poisonous "saliva" the octopus has formidable weapons. A crab trapped by one of the suction cups arranged in double rows on each tentacle finds himself drawn inexorably inward towards the mouth where the eight arms converge. The crab's struggles quickly cease apparently owing to toxic "saliva". The bite of even a small octopus leaves humans with a painful, enduring wound like a bee sting or the jab of a hot pin. Profuse bleeding and pain subside within an hour but the wound may be extremely sensitive for weeks. Whether the bite of one of the great Pacific octopuses, with its tentacle spread of twenty-five feet would be fatal is not known for no one has ever been bitten by one. Scientific literature about the cephalopod group, to which both the octopus and squid belong, does not contain a description of a giant living squid, since no fishing or research ship has ever captured one. However, the imprint of his adhesive cups, the size of an elephants foot, have been found on the skin of sperm whales, and his ugly beak in their stomachs. Were it not for the fact that some few dead giant squids washed up on the shore of Newfoundland and North Europe during the nineteenth century, science would have little authentic description of these legendary creatures .